The Mental Health Fringe Award was deservedly won by Kane Power at the Scotsman Fringe Awards for his first solo project ‘Mental’, performed at Edinburgh’s Assembly Roxy. Power describes his first one-man show as ‘an exploration of the modern mind with music, anecdotes and medical notes’. He was able to create an atmosphere of empathy, as well as depict the complexity of his mother Kim Power’s struggle with bipolar disorder in an ardent and relatable manner. His language in describing his relationship with his mother sometimes felt like listening to poetry. He entwined educative but incredibly personal elements of their journey together through the use of poignant song lyrics, desperate to be in his mother’s mind and ‘bring her back to Earth’. The set, created by Ruby Spencer Pugh, featured an illuminated graph of brain waves: Power creatively explained they were the comparisons of somebody suffering with bipolar disorder and somebody without it. He reproduced the journey into his mother’s head with acoustic guitar and keyboard; the journey felt palpable as the music represented the ‘manic’ phase of bipolar disorder with abrupt transitions to the depressive nature of the disorder. These aspects of the show were particularly engaging and potent, allowing the audience to gain a sense of the disease. Overall, the performance allowed me the opportunity to meet someone who could honestly speak about their experience of a loved one suffering with a mental health problem. Power openly explained that he is not an expert, and that this was merely a depiction of his mother’s lived experience of living with bipolar disorder. Another event which explored the topic of mental health was a raw and vulnerable performance by 26-year-old Nicole Henriksen. The award-winning performer explores her experience of anxiety in ‘A Robot in Human Skin’, a one-woman show at the Underbelly, Edinburgh. Through a series of comedic and emotional anecdotes, Henriksen spoke in a way that allowed each individual to feel present on her journey. For a moment, imagine sitting on the bus and suddenly feeling your heart rate speeding up. The next stop is your stop. You quickly get up, removing yourself from the idea that someone might spontaneously sit next to you. Running to the doors and beginning to sweat, you wonder if you’ve missed the stop, or better, it is instead much later than you thought. This was one of many thought processes that Henriksen was able to effortlessly present, laced with humour with a fluid transition to emotion; she invited the audience into her world of persistent worry. Henriksen included several different portrayals of her encounter with anxiety and need to be perfect (akin to being a robot), as well as speaking to us about her experience. She performed in only her undergarments and a box on top of her head; ironic to the anxious person that she was inside her brain. She introduced each segment of the production with clear, written signs stating at which point she was at in the show. This highlighted her need for structure, because without it, she would remain anxious. She went on to share her battles with feeling alone with anxiety, and reflected on the positive reactions received when she told them that she suffered from the condition, reinforcing the importance of unconditional understanding. Henriksen was not only courageously outspoken about the way anxiety affected her, but she seamlessly invited the audience on the journey to understand it. In a different format, ‘Fine, thanks’ was a verbatim musical performed at Edinburgh’s C Venues, and featured a multitalented cast of 15 young people. The underlying theme of the show was to help break the boundary between speaking about a mental health and physical issue; they should be analogous. The production was set in a ‘group discussion’ style – where the characters openly shared real experiences and struggles with mental health and drug addiction, reinforcing the growing idea that it is most definitely fine to speak about your mental health. This style of awareness raised the beneficial impact of having a discussion, but it felt short in its attempt to introduce anything particularly novel in our understanding of the importance of mental health. Despite this, the cast creatively raised some very critical points using song, such as the fact that more than one in four individuals will experience a mental health problem and if that if it isn’t you, then it will be somebody close to you. It appeared deliberately amateur, allowing those without a background in understanding mental health to relate in some form, through discussing exam and parental pressure on children as well as the role the government has played in escalating these concerns. The final show I attended was a stimulating insight into modern neuroscience performed at Edinburgh’s Assembly George Square Studios. Baba Brinkman, emphasising his niche as a ‘middle class, white Canadian peer-reviewed rapper’ uniquely explored the scientific study of consciousness and probability theory in his ‘Rap Guide to Consciousness’. He focused on the ‘hard problem’ of consciousness, questioning why we have subjective experiences at all. He went onto explain that some neuroscientists believe that there is no hard problem; it is simply a flawed intuition, comically highlighting that it’s ‘like believing that your children are above average’. The production condensed and cleverly simplified modern neuroscience into a collection of rhymes, humour and lecture-style talks. Brinkman introduced a famous philosophical argument, described as the ‘Knowledge Argument’ by Frank Jackson in his 1982 'Epiphenomenal qualia' paper. It is the assumption that an individual, Mary, knows all the physical facts that there are to know about colour vision from a black and white room – without having seen colour herself. Mary then leaves the room and enters the colourful world. The question is – did Mary learn something new? Brinkman has a refreshing stage presence, interacting with the audience and encouraging us to participate in answering these sorts of questions: why does subjective experience feel like something? Why does it feel as though there is a hierarchy of conscious beings? Why do we feel worse when we hear of a suffering dog and not a suffering insect? 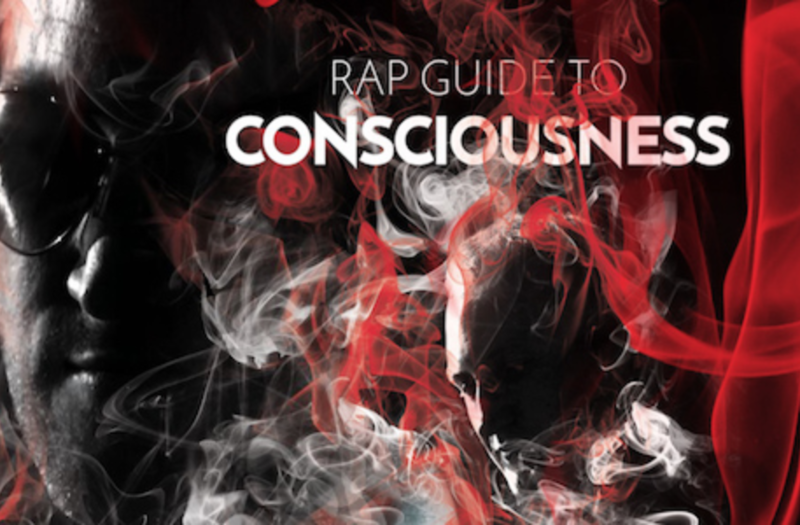 The Rap Guide to Consciousness offers an insightful, greatly informative experience in learning about modern neuroscience in a manner that didn’t feel like the typical experience of learning something new. Brinkman offers a funny, but serious appreciation of the wonders of the human mind. - Tanya Bhayani is an undergraduate psychology student at the University of Aberdeen.